It's unusual for the NTSB to investigate multi-vehicle crashes like the one that happened on the Eisenhower Thursday, but while their probe is getting underway, State Police have revealed their investigation into the fatal accident. NBC 5's Charlie Wojciechowski has the details. 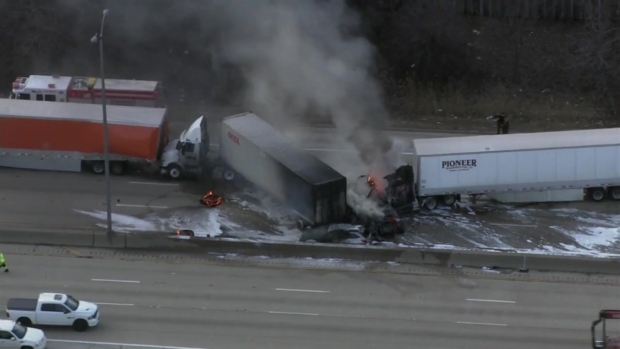 The fiery seven-vehicle pile-up that left one person dead and several others injured on the Eisenhower Expressway Thursday afternoon was the result of a chain-reaction crash that began as traffic slowed on the roadway, police said Friday. The crash took place just before 2 p.m. in the inbound lanes of Interstate 290 at St. Charles Road near west suburban Elmhurst, according to Illinois State Police. Three cars driving in the far right lane were stopped in traffic when one of the vehicles, a red 2004 Chrysler sedan, was rear-ended by a semi-truck, ISP said in a statement. All lanes of the Eisenhower Expressway reopened early Friday, hours after a deadly multi-vehicle crash near west suburban Elmhurst. NBC 5's Lisa Chavarria reports. 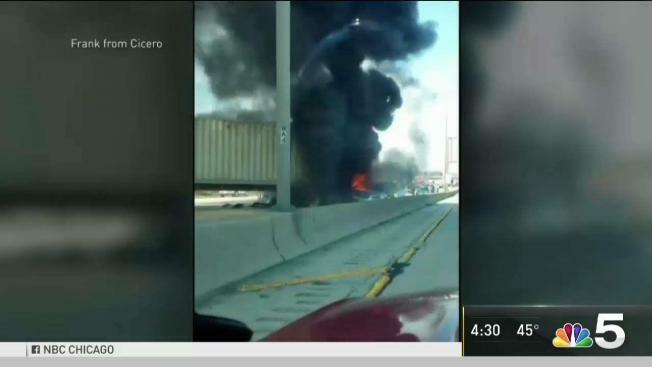 The collision caused the Chrysler to crash into another semi, which then hit a third truck. The trailer from the semi hit by the Chrysler was then pushed into the middle lane of the roadway and into a 2016 Subaru SUV, forcing the Subaru to hit a 2016 Ford SUV, which then slammed into a concrete barrier. A 2018 Toyota van then "failed to reduce speed" and rear-ended the Subaru, authorities said. The driver of the Chrysler was killed in the collision and the entire expressway was shut down for hours. The driver was identified Friday as 37-year-old Christopher Follett of Munster, Indiana. Two of the injured drivers were taken to Elmhurst Hospital and another to Loyola University Medical Center in Maywood, according to police, all with injuries that were not believed to be life-threatening. All other drivers were treated at the scene, officials said. Lanes were closed for several hours overnight, reopening after debris was cleared by 3 a.m. 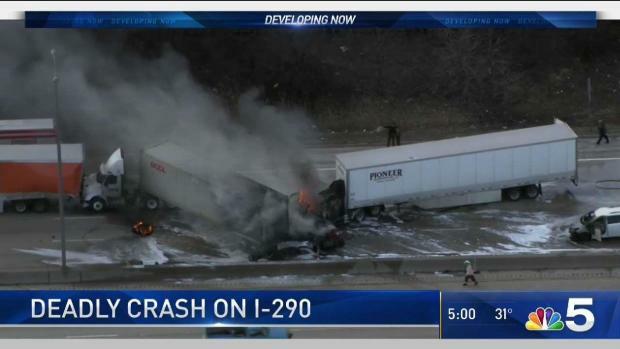 Drivers who often travel down that particular stretch of I-290 said the area can be dangerous. "People try to shoot over last minute and even semis will do the same thing," Chiara Difede said. "It happened to me last night and I got lucky," she continued, adding that she's "praying for those today who were injured. " The National Transportation Safety Board was expected to send a team of seven people to investigate the crash Friday afternoon. Investigators will look at the cause of the incident, examine fuel tanks and look at the rear-end collision, the NTSB said. The group will also look at electronic logging devices to help them determine what happened.